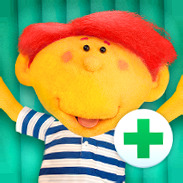 Featuring TV's Dr. Ranj and his puppet friends, Get Well Soon Hospital is a free digital resource, created to both educate and reassure preschool children about trips to the hospital. Join Dr. Ranj and his friends in this educational app for kids aged 3 upwards. Kindle Entertainment is a multi award-winning independent production company set up by co-company directors, Anne Brogan and Melanie Stokes in 2007. Kindle Entertainment has produced stand-out drama and comedy drama series for the BBC and Sky One, as well as making a raft of high quality shows for younger children including, Big and Small, Dinopaws, and the much loved factual entertainment series with Dr. Ranj, Get Well Soon. Kindle Entertainment’s productions have been recognised by the International Emmy Awards, BAFTA, the Royal Television Society, the BANFF World Media Festival and the Shanghai TV Festival, amongst others. Plug-in Media is a BAFTA-winning digital production company making engaging and inspirational entertainment for kids and families. Our interactive work transforms linear TV shows into outstanding apps and games; our original IP slate uses digital to springboard new stories across multiple platforms and includes Tee and Mo, a co-viewing brand for children aged 3-5 and their caregivers.